Flow and pressure in the vasculature, especially in the veins, are affected by gravity (Fig. 23). First consider an individual who is lying down. In this position, the only force affecting pressure in the blood vessels is that generated by flow through them because all levels of the cardiovascular system are at about the same vertical height. Upon standing, however, the pressures generated by the hydrostatic columns of blood in the vessels become quite large. At the beginning of this chapter, we stated that 100 mm Hg are generated by every 136 cm (54 inches) of water (or in this case blood, which is only slightly more dense than water). Consider the arterial system of a 6-foot-tall individual. When standing, the hydrostatic column will cause the pressure in an artery at the base of his foot to be 133 mm Hg higher than that in an artery in the top of his head. That is remarkable considering that mean arterial pressure at the heart is only about 100 mm Hg. Because of the position of the heart high in the chest, arterial blood pressure is high enough to force blood to the head because there is only about a 30-mmHg hydrostatic column between the two structures. If the gravitational acceleration were increased, such as occurs in a high-performance aircraft during a tight turn, the arterial pressure loss to the head due to hydrostatic columns can be a problem. At three times the acceleration of gravity, the arterial pressure to the brain approaches zero and the pilot loses consciousness. 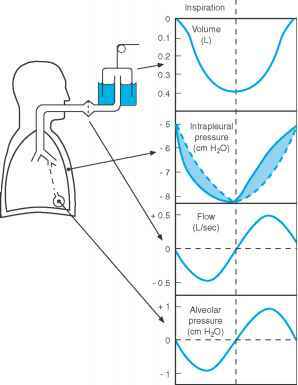 Hydrostatic columns augment the pressure in the arteries below the heart. Figure 23 reveals that, upon standing, an additional 100 mm Hg are added to the arterial pressure at the feet.